Even as there has been no respite from continuous rain and snow in the higher reaches of the state, the Meteorological Department today said the intense cold wave conditions would continue till January 26. Having failed to remove encroachments from forest land within the deadline, the Forest Department has sought time up to June 30, 2012, from the state high court for carrying out the job. The first-ever election of the state Youth Congress held through secret ballot in November in which Vikramaditya, son of Union Minister Virbhadra Singh, trounced his main rival, Raghubir Singh Bali, son of senior Congress leader GS Bali, by a huge margin of 3,485 votes, has been held null and void. It can literally be termed as their flight to freedom from the freezing cold of Kufri, where they spent the past nine months living in inhuman conditions, back to their home in Assam from where they were brought here to work as bonded labour. The Revenue Department’s claim of providing instant computerised copies of revenue records to applicants from the office of the tehsildar here seems to have fallen flat as the server in the office has conked out and the district administration needs Rs 2.5 lakh to replace the machine. After a resounding success at home, the thespians of The Lawrence School, Sanawar, are ready to stage “Remember The Legends” at the NCUI Auditorium, New Delhi, on January 21 and 22 and at the Tagore Theatre, Chandigarh, on January 26. Maintaining that Chief Minister PK Dhumal has adopted an anti-UPA stance to divert attention from his own failures, the Congress today asserted that the government in the state was virtually running on central assistance for the past four years. The week-long Makar Sankranti festival concluded at the Brajeshwari temple here today with the removal of the 18 quintal butter idol, which was made on January 14. The butter was distributed as “prasad” among devotees today. The cold wave has paralysed life of residents of Kinnaur, Chamba, Lahaul-Spiti, Kullu and upper parts of Shimla and Sirmaur districts. The forecast of more rain and snow is likely to further aggravate their problems. Power and road connectivity in most areas has been affected badly. Efforts to restore electricity and vehicular traffic have become difficult with no let-up in snowfall in the Rohru, Jubbal and Rampur areas. With a fresh western disturbance approaching, snow and rain are likely to lash the hill state till January 26. “Residents of the state are not likely to get respite from the biting cold as a fresh western disturbance will bring in more rain and snow till January 26,” said Manmohan Singh, Director, Meteorological Centre. 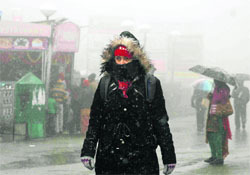 It is after 2005 that Shimla and the surrounding areas have received such a heavy snowfall. The total snowfall received during the month of January so far this year has been 87.2 cm as compared to 109.4 cm in 1993, 96.6 cm in 2004 and 94.3 cm in 2005. However, the maximum snowfall received in recent years was in 1990 when in December alone the town had 204 cm of snowfall. The minimum temperature recorded in the town today was -1.9°C along with 1.5 cm of snowfall last night. Today also it continued to snow intermittently throughout the day, making the day temperature fall by two degrees. Kalpa in Kinnuar and Manali too received fresh snow during the past 24 hours. The minimum temperature recorded at other places was: Sundernagar 4.7°C, Bhuntar 3.4°C, Kalpa -6.0°C, Dharamshala 2.1°C, Una 3.7°C, Mandi 4.6°C, Nahan 3.7°C, Keylong -12.9°C, Palampur 2.0°C , Solan 0.4°C and Manali -2.4°C. According to the forecast for the next two days, there will be more rain and snow at most places, prolonging the cold spell. This is the second time that the department has sought an extension of the deadline. Initially, the high court had given four months for the removal of the encroachments after the registration of cases. FIRs were to be registered in all cases involving more than 10 bighas of land by June 30 last and the unauthorised occupants evicted by October 31. As the department failed to complete the job within the time limit, it sought more time and the court extended the deadline up to December 31, 2011. However, not much headway has been made and of the total 2,484 FIRs registered, demarcation has been carried out only in 251 cases so far. Challans have been field in court in 14 cases and 27 cases are before divisional forest officers who have been vested with powers of the collector under the Public Premises Act. The main plea of the department is that the process of demarcation takes much time and unless the exercise is completed and encroachment detected, further action cannot be taken in the matter. It has pleaded for extending the deadline by another six months up to June 30. Meanwhile, the department is under pressure for the withdrawal of FIRs from influential encroachers who are ready to vacate the illegally occupied land, but want the cases settled amicable. However, it will not be easy as once a criminal case is registered the process of withdrawal of FIR has to go through the judicial process. Moreover, under the Public Premises Act, a minimum fine of Rs 10,000 per bigha or the market rate, whichever is higher, is to be levied by the collector. The matter has been referred to the Law Department for legal opinion and a final decision in the matter will be taken only thereafter. There are in all over 9,600 cases of encroachment involving 1,850 hectares of forest land. While the votes polled by each candidate in the election were declared by the Pradesh Returning Officer, the declaration of the final result was withheld pending an inquiry into complaints of irregularities and violation of the code of conduct against Vikramaditya by the Foundation for Advanced Management of Elections (FAME). After conducting detailed inquiries, FAME has come to the conclusion that Vikramaditya had violated the code of conduct. It has instructed the Indian Youth Congress Election Authority to declare the poll for the state null and void as there was no level-playing field during the poll. It has further directed the authority to hold a fresh election only for the state committee for which Vikramaditya will not be eligible to contest. The development has come as a setback to Union Minister Virbhadra Singh as the impressive victory of a novice like Vikramaditya was attributed mainly to his support base. This is the story of eight children hailing from Lakhimpur and Sumitpur districts in Assam, who started their homeward journey from here yesterday after being rescued a few days ago. Accompanied by volunteers of Child Line, Shimla, and the local police, they were to leave Delhi for Assam today to return home. “I can’t wait to get back home as this has been the most dreadful experience I have ever had. I will never step out of my village again,” says 16-year-old Ramjas Topo, narrating the nightmare. The eight boys - Arjun, Shiva, Bulbul, Samera, Sajan, Sukra, Biru and Ramjas - say they were brought from Assam by a woman who identified herself as Dolma from Kullu to work in Delhi on a fixed salary. However, the woman could never be identified even though a case was registered under the Bonded Labour Act. It was during an outreach programme organised by Child Line, Shimla, in Kufri that one of the boys sought help. “We managed to rescue the eight boys living in pitiable conditions with the help of the Deputy Commissioner, the SP and the Labour Department, but finding their exact addresses was a tough job as they had little information about the exact addresses,” said Anita Sharma from Child Line. Various agencies managed to get the exact addresses of these boys. It was due to the personal interest taken by Shimla Deputy Commissioner Onkar Sharma that these children were released from the custody of pony owners operating in Kufri on December 23. He said the children were neither given enough to eat or a proper place to stay. “Their plight could be gauged from the fact that one could not stand near them as they were smelling so bad,” he added. In fact, the pony owners in Kufri were made to shell out a sum of Rs 1.78 lakh against labour charges for the work these boys did there. The staff have switched over to the new computerised system and have almost abandoned the old manual system of providing revenue records. The applicants are at the receiving end as the district administration has expressed its helplessness due to the conking out of the server. Applicants alleged that they were running from pillar to post as the tehsildar’s office had failed to provide them copies of revenue records and other documents for the past one week. This will be a befitting tribute to Shaheed Bhagat Singh when the entire nation is overwhelmed in the patriotic fervour of freedom and regalement. There will be four shows spread across three days and distinguished personalities that will grace the occasion include Anshu Vaish (IAS) Secretary, Department of School Education and Literacy, Ministry of HRD; Pankaj C Munjal Chairman and CEO Hero Group; and Justice Rajive Bhalla of the Punjab and Haryana High Court. The chairman of the media department of the party, Mukesh Agnihotri, said here today that Dhumal was taking credit for all central projects like Central University, the IIT, the NIFT, the ESIC medical college, new national highways and numerous schemes under the National Rural Health Mission and at the same time trying to discredit the UPA government at the Centre for its failure to maintain roads and provide other basic necessities. The state was getting over Rs 600 crore under MNREGA alone and the government was using these funds for a host of maintenance and development activities, besides providing employment. If one took away all these central-funded programmes, the BJP government in the state had hardly anything to show as achievement. Despite shivering cold and rain during the past one week, thousands of pilgrims from all over the country thronged the temple here to pay obeisance and have a glimpse of the butter idol. The butter “prasad” is believed to cure chronic skin ailments and joint pains.